Drew and I love escaping to the mountains with our little family, especially this time of year! Autumn time in Utah is absolutely gorgeous! We live right below the mountains so we always make sure we spend plenty of time in the canyon enjoying the changing colors and cooler temps. Before we headed to NYC we went to our favorite spot and roasted some S’mores and let Dash chase the ducks in the lake. UGG Australia boots are always a wardrobe staple for me, especially during the fall and winter months. These are my newest pair for the upcoming season, they’re cute and SO comfy and I can’t wait to show how I style them throughout the next few months. What boots are you excited to wear this fall? Brought to you by UGG Australia. Love this cozy look! I’ve been thinking about getting a pair of grey Uggs for this fall/winter! Thanks for sharing! Such pretty photos Rachel! Love the UGG’S! You look so cozy! Wish it was cooler here in Florida so I could enjoy wearing flowing sweaters and boots. Hopefully soon! The morning are getting cooler, and the air is a tiny bit drier. Any way, hope you enjoy your day! Love your boots, they look so cozy! Uggs are such a staple of cold weather months! Love the color of these ones! This is a great outfit and it does look super cozy! The mountains look so dreamy…I would spend every weekend there if I lived there! I admire your bravery to wear white around your baby haha. Your Isla is so sweet :) I love the little bow headbands you have for her! Wish wee lived somewhere closer to the mountains! I love cozy winter whites. This is such a pretty look! Love the outfit!! So cozy indeed… beautiful, neutral colors!! I’m loving this cozy look, the exposed shearling on those boots is too cute! Beautiful pictures! great casual outfit! I know people say Ugg boots are ugly, but I love them! They are so warm and comfortable. UGGs as are the best! Love the color of your boots and that Splendid sweater. Can you please share your necklace info? Thanks! I live in my UGGS during the fall and winter too. They are seriously the most comfortable and warm boots ever. If only they were snow and water proof! My fav UGGS have been the black ankle ones with black sequins. I love UGGs! Great look! Your Ugg boots look so comfy and warm! I love a good, cute pair of PJs. There are great because they aren’t too obvious. Love it! I love this all white outfit, and you paired those Uggs so gorgeously! I can’t for LA to stop being 90 degrees so I can wear a cute cozy look like this! Looks like such a pretty spot! Love your cozy sweater! Love your Uggs! I just ordered another pair for myself. I live in them during the winter. They will never go out of style for me. Love this style of Uggs. I need a new pair for my boys’ hockey season (I have 4 who play, so I need my feet to be warm). Is the color “Stone” that you are wearing? Love these! I like the sweater very much! It looks perfect with those white jeans. Anyway, I hope you have a wonderful day! That sweater looks like a dream and these pictures are so beautiful! OMG!!! Your baby is so big, so beautiful!! Rach please post the outfits that you wore in New York, I’m dying to see more details!! kisses from you fan from Brazil!!! Such a comfy but beautiful outfit! Love the backdrop, gorgeous! I am liking this white on white trend, super chic! Maybe I’m wrong but I feel like you recently shared a post like this already with UGG. I guess it’s part of the sponsorship agreement. 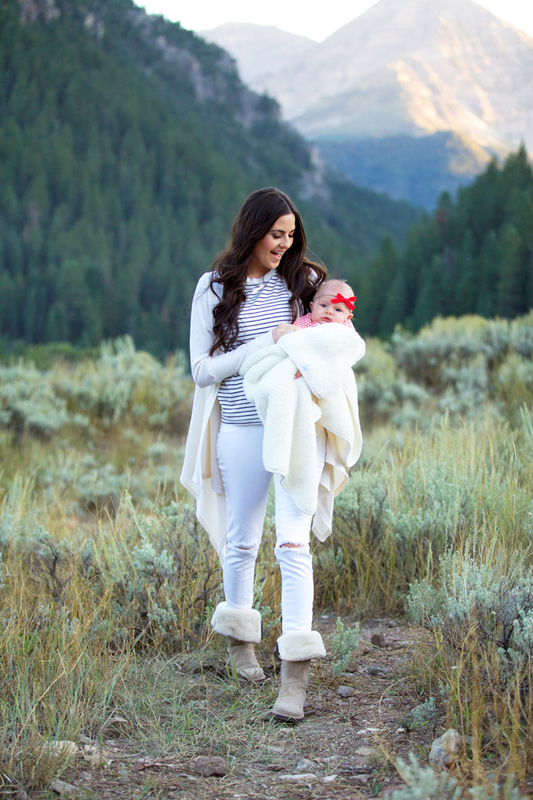 They look super cozy and your little one is adorable! love the boots with the all white!! Cute pictures! Little Isla looks adorable as always! Isla Rose is so sweet! I love these boots. The scenery is absolutely gorgeous! I love wearing white for this season! I just love your style. Which canyon is your favorite? I’ll be there next weekend and can’t wait to take the scenic route! Your little Isla is so precious! by no means understand. It seems too complicated and extremely broad for me. That sweater looks super cozy! I’m so ready to pull out all of my cardigans but the weather has been so all over the place. I’ve never been a fan of uggs but these are SO cute! Autumn is very pretty! I hope you all enjoyed the moments together!! I love this!! You look so effortless and I love seeing white after labor day! I love this outfit! It’s fall perfection! Love this outfit! Those uggs look so comfortable. You’re stunning even in the most casual of outfits :) love this look on you! And Utah does look gorgeous this time of year! This look truly looks amazingly cozy & I love that you incorporated so much white into this outfit! Beautiful as always! I am liking those boots! Super cute! I live in my uggs this time of year! I literally have 8 pairs! LOL!! Looks beautiful there. I found this post on Pinterest and you look amazing! Love this winter look, although I can’t imagine bundling up that much right now. Hoping it’ll cool down here soon! Your Uggs are so cute! You are so blessed to live in such a beautiful place! I love how you and Drew really enjoy nature with Isla and Dasher Boy! Very cozy look. I adore these Ugg boots!! I wonder if they are too hot for california? Thanks for posting. Love this casual look. So comfy boots. Ah.. look at sweet little Isla’s bow- so cute!! Such gorgeous scenery…Uggs are so comfy/cozy!!!! What a view! Love the white jeans too!! !